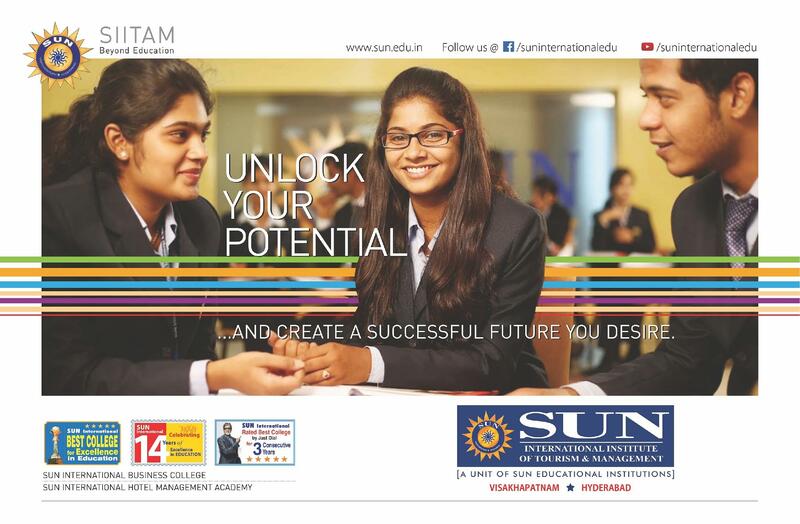 Sun International Institute of Tourism and Management (SIITAM) is a Private Institute located in Hyderabad, Telangana. 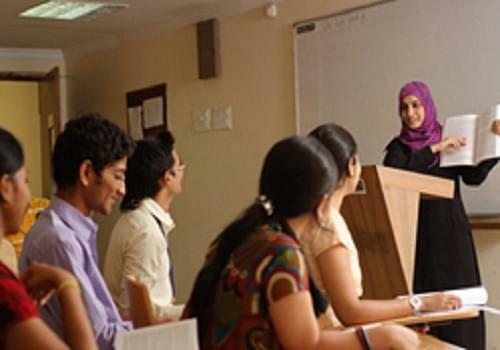 The Institute was established in the year 2008 with an aim to offer curricula in the field of Hospitality Management and Business Management education as demanded by the Industry. 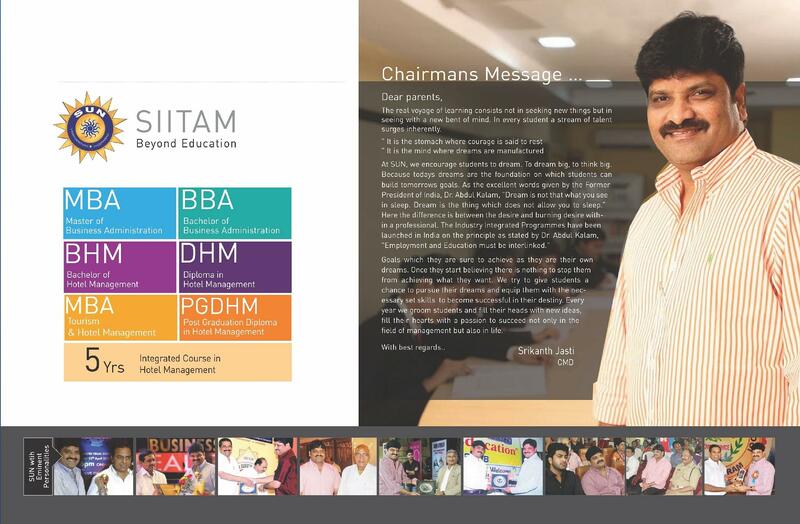 SIITAM is affiliated to Osmania University, Hyderabad and is approved by University Grants Commission (UGC). 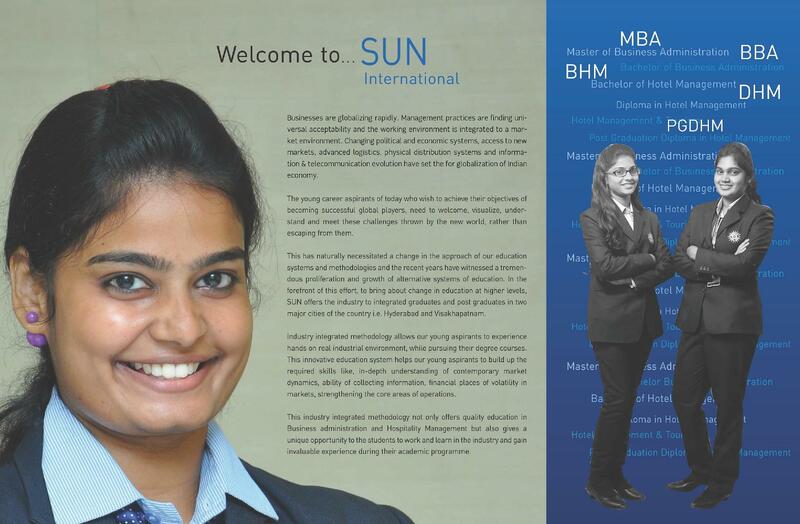 Courses offered by SIITAM are BHMCT, BBA, MBA, DHM, PGDHM and Integrated course in Hotel Management. SIITAM Placements are offered to all the candidates through its dedicated placement cell. The placement cell works throughout the year in order to provide best placement opportunities to the candidates. 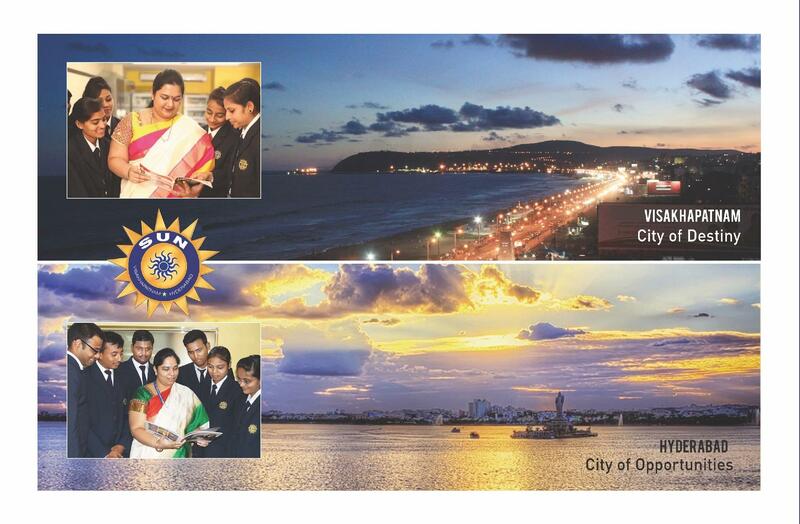 The highest number of students were selected for Oberoi’s Ocer (Management Trainee Program) in South India. Highest Record in placing 2,000 students at International level for the well-reputed properties like Accor, Burj Khalifa, Clarks Group, Hilton, Palm Jumeirah and Starwood etc. The only college selected for Management Trainee Program for “The Park Group”. 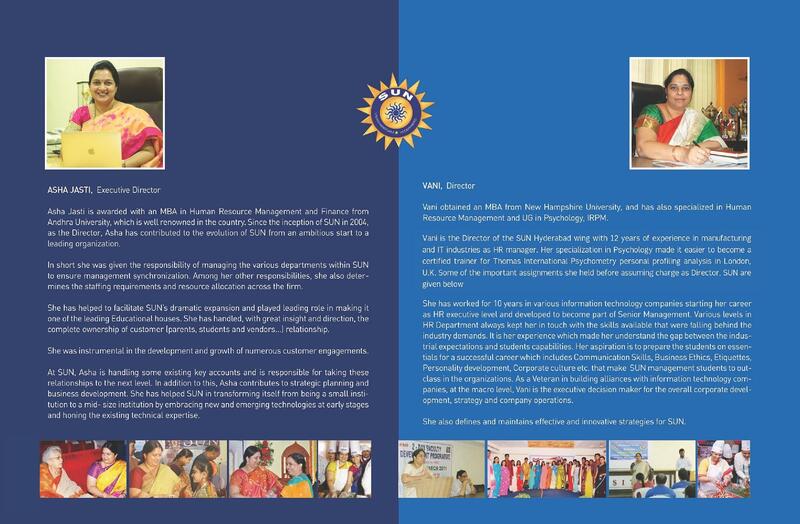 A bench mark record in placing Management Students in reputed MNC’s like Accenture, Amazon, Dell, Deloitte, Goldman Sach, IGate, TCS and WIPRO etc. Stood 1st in Accor worldwide Takeoff Competition. Students working with top International Airlines like Cathay Pacific, Indigo, Jet, Lufthansa and Qatar Airways etc. Students working for cruise lines like Celebrity cruise, Disney, Princess and Royal Caribbean etc. In order to encourage the students to work hard and excel, SIITAM offers various scholarships to the candidates on the basis of Merit. This institute is very good in every thing. The most loved spot of Students as here they have loads of fun in any occasion it is a huge hall, which can easily house hundred students. Hi Rakesh, To get information about the MBA program through this link: Admission Details. Chef B.R. Ravi KumarPrincipal, Department of Hotel Management, Food & Beverage Production and Bakery & Patisserie. The entrance to the college does not require the student to appear for any special exam. 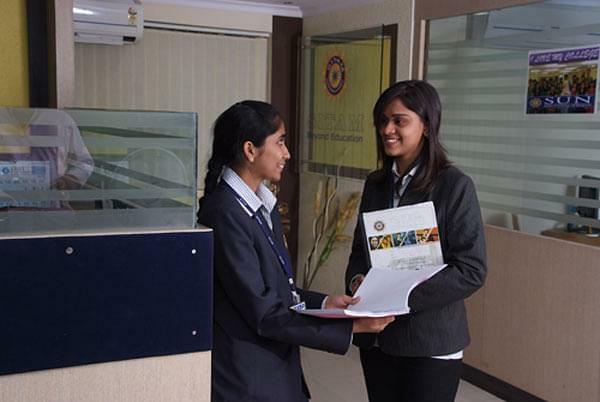 Hence, the admission process is entirely based on the counselling given by the college. There is no additional exam required for admission. So, the admission is only based on the counselling given by the college which is a must to attend for the students.